No, your eyes are not deceiving you. This 1999 Azzurro Nuvola machine is currently residing in America’s Dairyland a good 6 years before it has any right to be. In fact, this car has somehow been registered in Wisconsin since 2001 and, yes, you have the chance to own it. The story behind this car is foggy, to say the very least. Starting with the rather grainy dealer pictures, one can see that the gauges read MPH and the temperature on the infotainment screen is in Fahrenheit. This doesn’t make sense for a left hand drive European car, right? Continuing to the CarFax, the first record of this Alfa in the US was passing Wisconsin emissions in February of 2000. Interestingly, the car’s registration was issued almost a year later. The most logical assumption here would be that there was a bit of a hold up with initially getting it registered, unsurprisingly. Once registered, the owner proceeded to put on more than 83,000 miles over the span of four years, not insignificant considering the parts availability of an Alfa Romeo in the U.S. During this time, it seems that the only hiccup was failing emissions in 2002 after one year of registration. However, it passed a week later and has continued to pass ever since. But this is only a glimpse into this Alfa’s story. As seen on the CarFax, this car has been for sale since late August of 2017. Five thousand miles earlier, it had been initially listed for sale in 2014. Plugging the vin into Google leads to an article on BringATrailer from the first time it was for sale. However, even BAT couldn’t answer how this car got here. So deeper into Google I go, leading me to another BAT car. 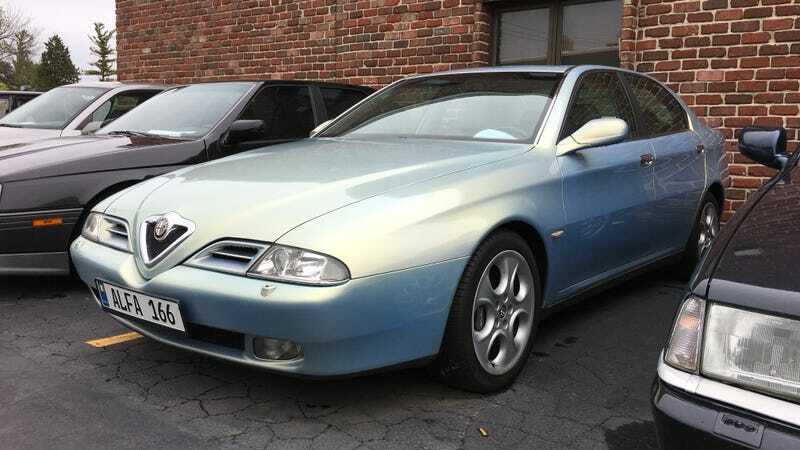 This one was a 2002 166 modified by AutoDelta USA to supposedly bring the car into compliance with US regulations as evidenced by the amber reflector on the front bumper. Unfortunately, this was too good to be true. In 2003, the father and son that ran AutoDelta were arrested for illegally importing Alfas after getting about two dozen into the U.S. And this particular 166 currently for sale does not have US spec reflectors. How did I get these cars in the US? If I told you I’d have to...........you know the line! Actually there are two of these running around town. I know they were bought new from Italy but with English gauges. The other one is an automatic. I had a chance to buy it but it had 120,000 miles and was an automatic. Mine is a 6 speed and has only 29,000 miles. The automotic one still looked new! I think these cars have good rustproofing because we use a lot of salt in Wisconsin. They were imported by some Italian nationals living here. How they got clean titles is a question I don’t want to ask. Mine is licensed and passes emission testing. Yes, it does draw looks. I love the Nuvola paint job, even if it is not red. My next project with it will be to open up the exhaust some. It is just too quiet! The 156 is a better story. A Dutch professor had a teaching sabatical in North Dakota! He bought the car new and had it shipped as his personal property to the US. It had to pass a simple DOT and EPA test which it did. He was supposed to take the car back with him but he ended up selling it to my Italian friends. The professor also had a Harley. We build those in Milwaukee, WI. Those of us with Ducatis call them Hardly Ablesons but smile while saying so. 2003 was the 100 year anniversary for Harley so the professor rode to Milwaukee for the show. While here, he saw the 166 automatic being driven by a lady. He wanted to ask her where she got her car serviced so followed her. She thought a thug on a Harley was after her so they had a bit of a road race through Milwaukee. Finally she got stopped and he waved his hands and said he just wanted to ask her about her car. She told him about our local dealer. Professor 156 drove 500 miles to get his car serviced here. His tasteless girlfriend fell in love with a black Porsche and he traded in the 156 for it. My friends had the 156 for 1 1/2 years and kept telling me they were saving it for me. One day my wife was at the shop and they told her we should come on Saturday to drive it. She asked for the keys, “I’ll just drive it now.” She bought it! We love the car. It had only 17,000 miles, 2.5, 6 speed. It is fast and handles great, especially after installing a front strut brace across the engine. I removed the center muffler and had a custom rear pipe with just a resonator there. It really growls. We have had the 156 for 3 1/2 years and no mechanical problems. The windshield wipers motor burned out and the rear door handles broke but that is an Alfa disease that’s incurable. We sure have a unique pair of cars and we love them. Sure there are no parts in the US but we have three spiders to fall back on, 1981, 1983 and 1961. Oh, we have a 1991 Ford Exploder too and a handful of Ducatis. This story seems to line up as his post was made on July 25, 2009. Looking back at the CarFax, a new owner of the 166 was reported on September 26, 2008 so it is very possible the user looked at this car around that time. The mileage reported on September 8, 2008 was 123,104 miles, which matches this user saying it had 120k on it when he looked at it. His story also explains the English units for the gauges and temperature. And there was this sticker lurking in the back window. I tried to look up these words, but, weirdly, not much was returned by Google. I did find a website that, as far as I can tell, lists “Longo S.P.A.” as an Alfa Romeo dealer in Venaria. Now, clearly, I cannot say this for certain, but it looks like that sticker is the original dealer sticker from when the car was bought new in Italy, which also matches the user’s story. Despite all of this information, it’s still unclear how this Alfa Romeo was registered at just two years old and how it has continued happily living in the US for 17 years. But, it still has a Wisconsin title so you can purchase it this very second from Reina International Auto for just under $11,000. In the meantime, I’ll be on the lookout for both the 156 and 166 sneaking around Wisconsin streets. A 166 between two 164s. Quite a rare sight in Wisconsin.